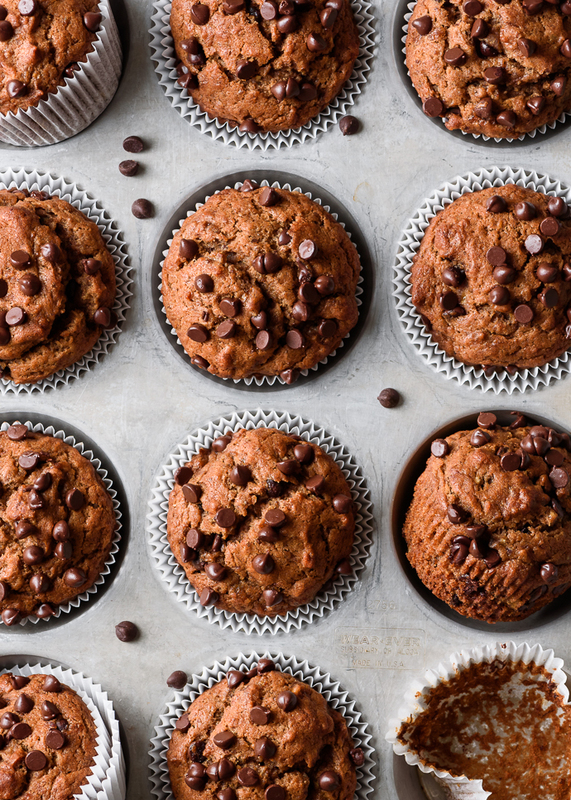 These naturally sweetened banana muffins are based on one of my favorite recipes on the blog: these double dark chocolate banana muffins, which are also a reader favorite. It seems like you all are muffin fans too! I made this version a bit healthier by swapping in some wholesome ingredients: extra-virgin olive oil, coconut sugar in place of refined sugar, ground flaxseeds for extra fiber and omega-3 fatty acids, and I also swapped out the egg for Henry (making them accidentally vegan). They come together in one big mixing bowl in just a few minutes, and make exactly 12 muffins, which I love – no extra batter hanging around for a second half-empty muffin tin. 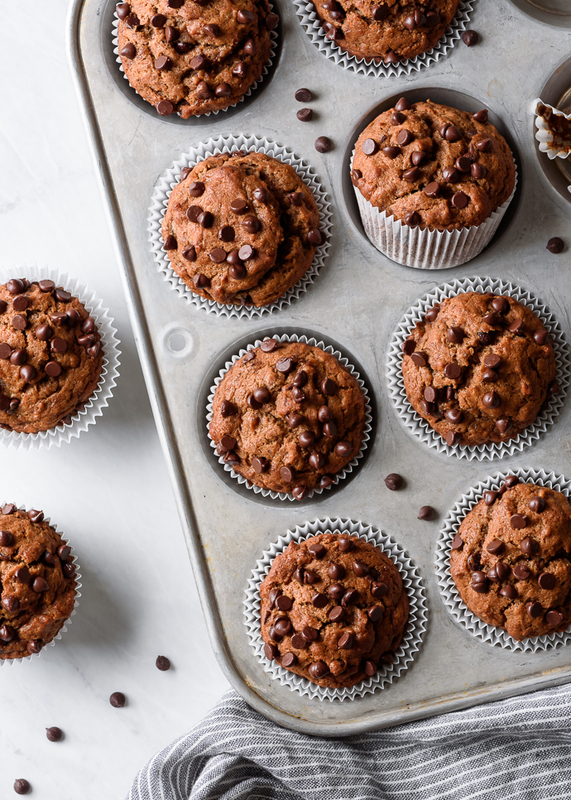 Moist and tender and topped with mini dark chocolate chips, these banana muffins taste just as delicious and indulgent as the “real” thing, but also happen to be a little bit better for you. Coconut sugar is an unrefined, natural sweetener that comes from the sap of coconut palm tree flower buds. The sap is heated to remove moisture, leaving the coconut sugar crystals behind. Similar in flavor to light brown sugar, with caramel notes, coconut sugar has a lower glycemic index than other refined sugars. 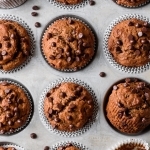 I love using it in baking recipes where I would traditionally reach for brown sugar, and since it has a slightly nutty, caramel flavor to it, works really nicely with the banana and cinnamon in these muffins. Whenever you’re baking with bananas, you definitely want to use the ripest bananas you can find. This will improve both the flavor and texture of the banana bread or muffins you’re baking, keeping things nice and moist. The riper the banana, the sweeter and more intense the flavor. 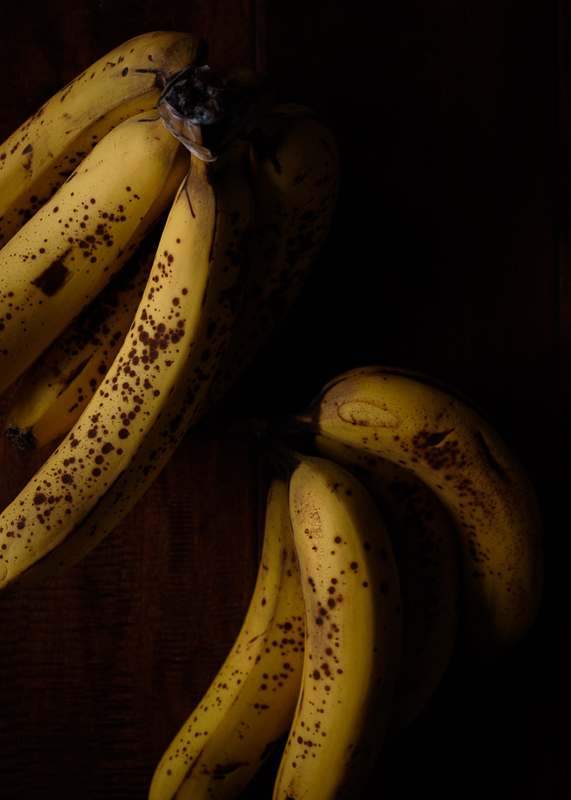 So look for nearly black, or incredibly speckled, very soft, and fragrant bananas – the ones you probably wouldn’t want to eat fresh or on your cereal. You can also freeze overripe bananas, either whole or in pieces (just be sure to note the quantity if you go that route), then defrost in the microwave or overnight in the refrigerator. They’ll look pretty disgusting when they thaw (oxidized and goopy), but will work just as well once mashed into the batter and baked. 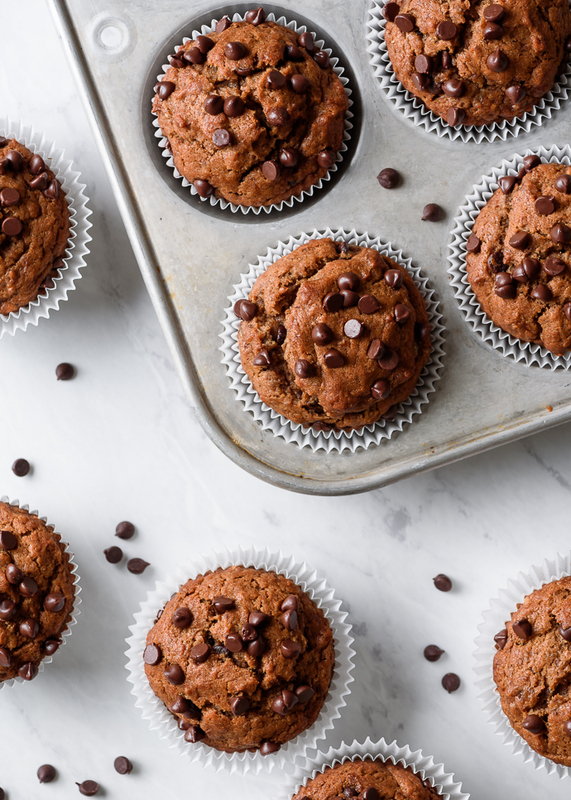 These banana muffins are naturally sweetened, dairy-free, and vegan, but are easily adaptable to lots of different diets and tastes. 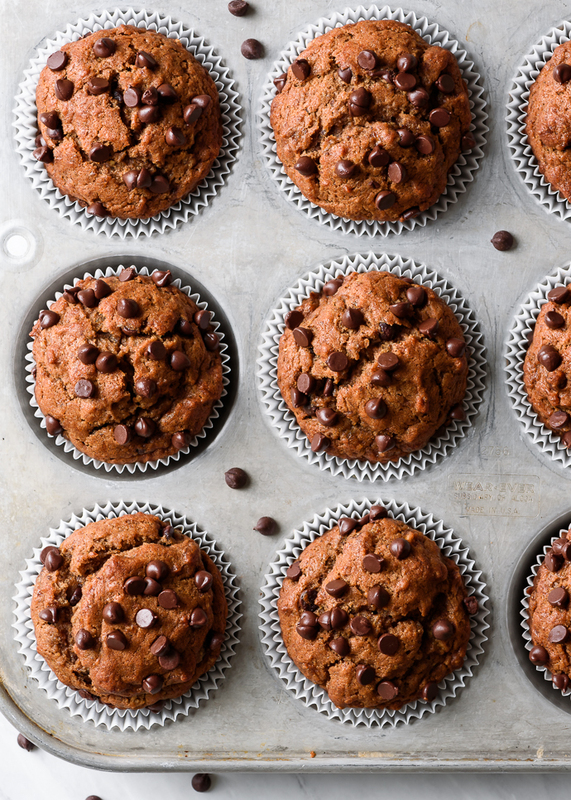 Make them double chocolate banana muffins: add 2 Tbsp unsweetened Dutch processed cocoa powder (after the milk), reduce the flour to 1-2/3 cups, and omit the cinnamon. 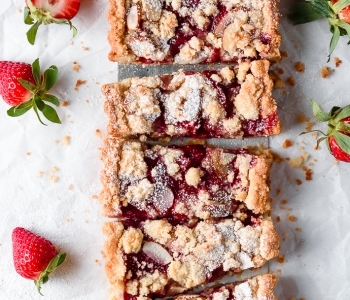 Make them gluten-free: substitute a 1:1 gluten-free all-purpose flour blend. Don’t like bananas? Try using pumpkin or sweet potato puree instead. Love doing this in the Fall! Want taller muffin tops? 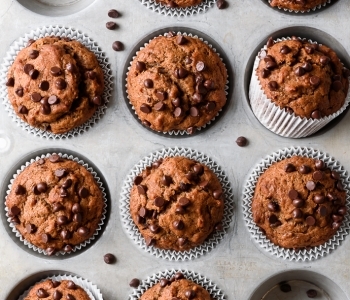 Fill 10 muffin cups instead of 12, and add a minute or two to the baking time. More melted chocolate? 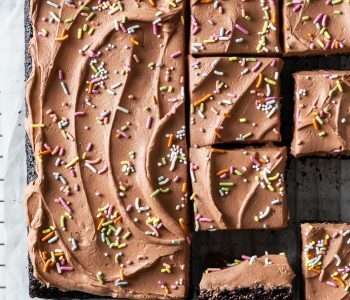 Instead of mini chocolate chips, add 2 to 4 oz of a chopped bittersweet (60-80% cacao) chocolate bar or feves to the batter and sprinkled on top. 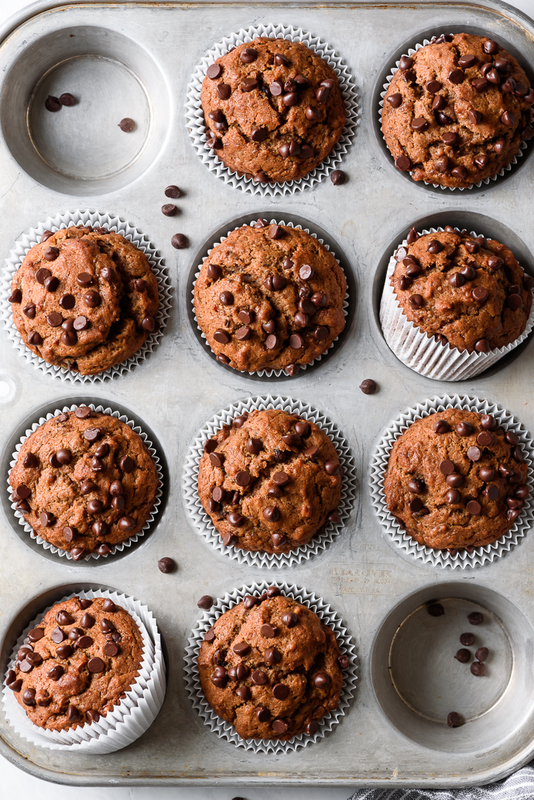 Easy bakery style chocolate chip banana muffins that are moist and delicious, require no mixer and just one bowl, happen to be vegan, and, naturally sweetened with coconut sugar, are a healthier breakfast treat. Preheat the oven to 375℉. Line a 12-cup muffin tin with paper liners or lightly grease with baking spray. Set aside. In a large mixing bowl, use the back of a large fork to mash the banana until only very small lumps remain. Add the vanilla and olive oil, and use the fork to whisk until completely combined. Whisk in the sugar and milk. 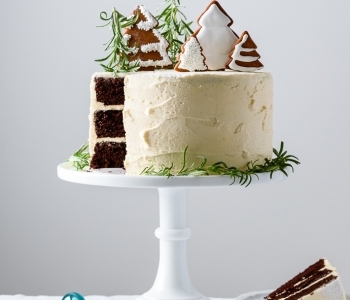 Switching to a spatula, stir in the flaxseed, salt, baking soda, and cinnamon, then gently fold in the flour and half the chocolate chips, until just combined. Use a cookie scoop to divide the batter between the muffin cups, about 3/4 full. Sprinkle with the remaining mini chocolate chips. Bake for 15-17 minutes, rotating once halfway through, until the muffin tops are gently puffed, and a cake-tester inserted into the center of the muffins comes out mostly clean. Remove from the oven and let cool in the muffin tin for 5-10 minutes, before removing and cooling completely on a baking rack. As always, they’re beautiful, too!